Here is a unique twist on a traditional gift for dad or the man in your life! 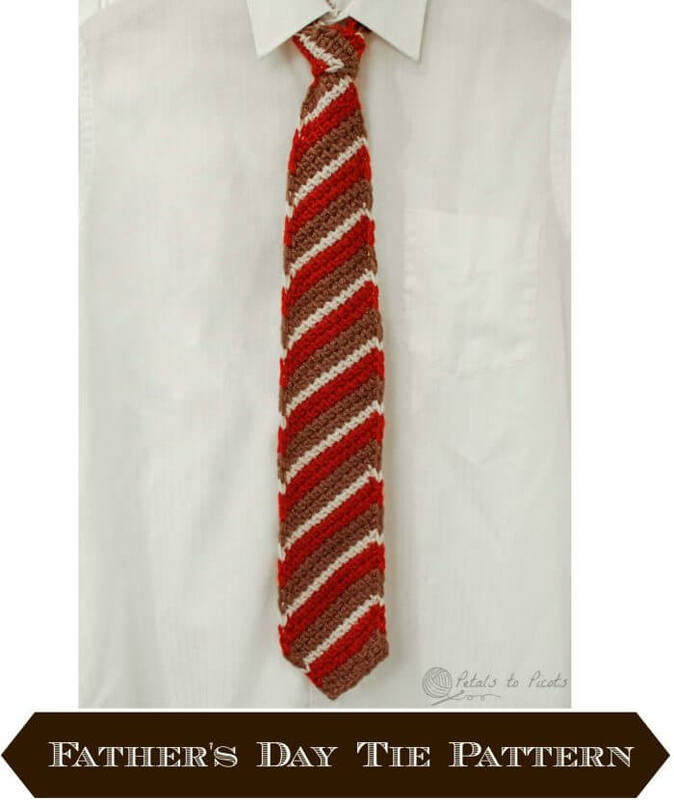 This Tunisian crochet tie will definitely add a fun, handmade touch to his dress outfit or his everyday suit and tie routine. You can work it in his favorite colors or pick colors from his favorite team or his company’s brand colors. There are so many ways to make this tie truly personalized and special for him. If you have never tried Tunisian crochet and would like to learn, check out my Learn Tunisian Crochet in a Week series here. Resources and tutorials you may find helpful in following this pattern: Tunisian Crochet Abbreviations and Symbols, Basic Forward and Reverse Pass. Basic Return Pass: Yarn over and pull through one loop, then yarn over and pull through 2 loops for the rest of the row until you have one loop left on your hook. Note: You can work this tie in one color or multiple colors. I used the sequence of 2 rows Chocolate, 2 rows Brick, and 1 row Linen. Row 1: Tss in the back ridge of each ch; work basic return pass — 8 sts. Row 2: Yo (counts as increase), Tss in each st; work basic return pass — 9 sts. Rows 3—7: Rep Row 2 — each row increases by 1 st, ending with 14 sts in Row 7. Row 8: Yo (counts as increase), Tss in each st; for return pass, draw through 2 loops across (counts as decrease) — 14 sts. Rows 9—27: Rep Row 8 — 14 sts. Row 28: Do not yo (no increase), Tss in each st; for return pass, draw through 2 loops across (counts as decrease) —13 sts. Rows 29—32: Yo (counts as increase), Tss in each st; for return pass, draw through 2 loops across (counts as decrease) —13 sts. Row 33: Do not yo (no increase), Tss in each st; for return pass, draw through 2 loops across (counts as decrease) — 12 sts. Rows 34—37: Yo (counts as increase), Tss in each st; for return pass, draw through 2 loops across (counts as decrease) — 12 sts. Row 38: Do not yo (no increase), Tss in each st; for return pass, draw through 2 loops across (counts as decrease) — 11 sts. Rows 39—42: Yo (counts as increase), Tss in each st; for return pass, draw through 2 loops across (counts as decrease) — 11 sts. Row 43: Do not yo (no increase), Tss in each st; for return pass, draw through 2 loops across (counts as decrease) — 10 sts. Rows 44—47: Yo (counts as increase), Tss in each st; for return pass, draw through 2 loops across (counts as decrease) — 10 sts. Row 48: Do not yo (no increase), Tss in each st; for return pass, draw through 2 loops across (counts as decrease) — 9 sts. Row 49: Yo (counts as increase), Tss in each st; for return pass, draw through 2 loops across (counts as decrease) — 9 sts. Row 50: Do not yo (no increase), Tss in each st; for return pass, draw through 2 loops across (counts as decrease) — 8 sts. Rows 51—52: Yo (counts as increase), Tss in each st; for return pass, draw through 2 loops across (counts as decrease) —8 sts. Row 53: Do not yo (no increase), Tss in each st; for return pass, draw through 2 loops across (counts as decrease) — 7 sts. Row 54: Yo (counts as increase), Tss in each st; for return pass, draw through 2 loops across (counts as decrease) — 7 sts. Row 55: Do not yo (no increase), Tss in each st; for return pass, draw through 2 loops across (counts as decrease) — 6 sts. Rows 56—62: Yo (counts as increase), Tss in each st; for return pass, draw through 2 loops across (counts as decrease) — 6 sts. Row 63: Do not yo (no increase), Tss in each st; for return pass, draw through 2 loops across (counts as decrease) — 5 sts. Rows 64—67: Yo (counts as increase), Tss in each st; for return pass, draw through 2 loops across (counts as decrease) — 5 sts. Row 68: Do not yo (no increase), Tss in each st; for return pass, draw through 2 loops across (counts as decrease) — 4 sts. Rows 69—137: Yo (counts as increase), Tss in each st; for return pass, draw 2 loops across (counts as decrease) —4 sts. Row 138: Do not yo (no increase), Tss in each st; for return pass, draw through 2 loops across (counts as decrease) — 3 sts. Row 139: Do not yo (no increase), Tss in each st; for return pass, draw through 2 loops across (counts as decrease) — 2 sts. I’m new to this stitch. I’d love a Tutorial on this tie if possible For some reason my tie is not coming out as in the picture. But I’m not giving up until I learn. It starts from the large end. Hi I just loved this tie pattern. I have started working on this tie. I found that it is folding on the sides and not stiff as it seems in the picture. Can u suggest how to make it stiff? Also, how have you finished with so many loose ends with the colour changes? Hi Sharada 🙂 So glad you liked the pattern!! I didn’t have any issues with folding or need for brainstorm ideas to stiffen it up. As for the loose ends, I carried the colors up the sides between color changes instead of fastening off after each row. Hi Sherina 🙂 The reverse pass for Rows 8-27 should be to yarn over and pull through 2 all the way across, as opposed to a normal reverse pass of yarining over and pulling through 1 loop first and then 2 the rest of the way across. This way you should end up with the same amount of stitches in each row even with the increasing at the beginning of the forward pass. Hope that helps!! Thank you for the pattern. I am struggling with rows 9-27…are you doing a YO (yarn over) to make a total of 15 stitches on the TSS and then reducing to 14 on the return pass? Is the intent to make the tie worked on a diagonal? Could you please show a photo of the whole tie? Thanks again. For the increase/decrease rows,does “draw through 2 loops across” mean the very first stitch on the return pass? Yes, the very first stitch and all stitches across. This should decrease your count by one. I’ve never tried Tunisian crochet, but I like the project. It’s a nice alternative to the standard tie. Thank you, Kara. Your tip about going into both front and back loops of the last TSS stitch was excellent. So glad you found it helpful!! 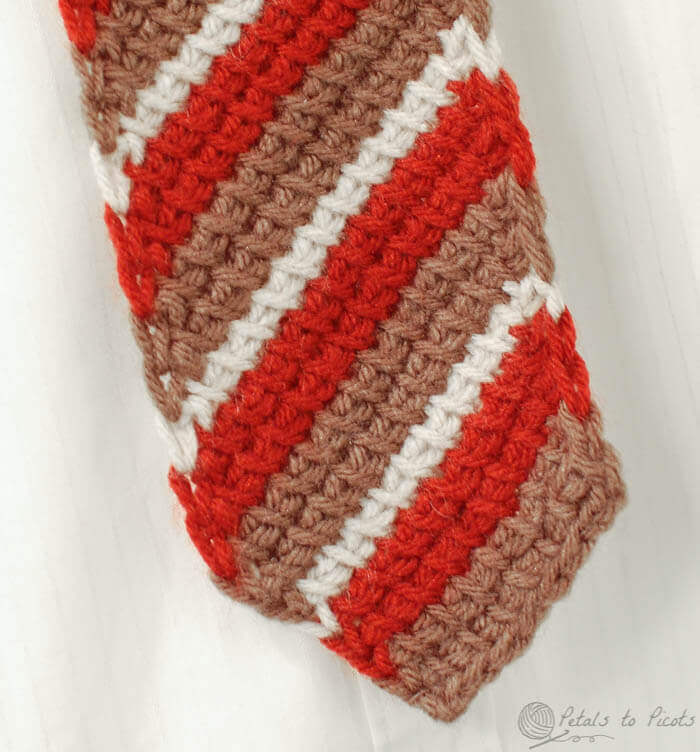 I am finally going to try Tunisian crochet, watched a video about the basic stitch you use in this great looking tie. Not sure what is meant by “Tss in each st; for return pass, draw through 2 loops across ” is it the same as Tss in each st but going through a third loop going back? I will try to clarify. Remember that Tunisian crochet consists of a forward pass and a reverse pass. Tss stands for Tunisian Simple Stitch. You work a Tunisian Simple Stitch in each stitch across (meaning you are pulling up loops through each vertical bar across. For the reverse pass, you will work these loops off the hook. The basic return pass is yarn over and pull through first loop then yarn over and pull through two loops the rest of the way across. Hope that helps! Great pattern. I willbe making this for sure for my boys! Shouldn’t rows 9-27 repeat row 8 not row 7? You have two row 7’s in the pattern. I think that’s a mistake. From what I’m doing, it looks like the second Row 7 should be Row 8, and then the numbers go up from there. Hi Victoria 🙂 What a cute idea! You can do that in a few ways. You can use a lighter weight yarn and smaller hook or you can eliminate a few of the center stitches throughout. Thanks for this pattern; it is really neat for a man’s gift. I am planning to make this for my grandsons. Thanks again for sharing, I appreciate it. Guess I am going to crochet this one next. Great idea and pattern Kara!! My hubby is always complaining that they don’t make ties long enough for him. Now I can crochet one as long as he wants!! Question?? what exactly does it mean when you say ” for return pass”?? are u refering to what u need to do when u reach the end of the row?? Yes, that is correct … you pull up all the loops on your hook on the forward pass and work them off on the return pass.